The Dana Warp Mill, which traditionally has been a home for industrial and manufacturing firms, has been undergoing a change over the past few years. Now, more and more, space inside the mill is being converted to office space, and the manufacturers who helped fill the mill from the beginning are finding themselves on the way out. As the mill continues to attract white-collar firms, which tend to have higher payrolls and deeper pockets than industrial or artisan workshops, rents continue to rise. As a result, industrial businesses that have been at the mill for years are not having their leases renewed and are being told they are going to have to find another home. Mill owner Tim Flannery said that he has chosen not to renew the leases of the manufacturing businesses, some of which are on month-to-month leases now. Instead of signing long-term leases with those businesses, Flannery said he would like to have those businesses start moving out of the mill by the end of the summer. Flannery said he is actively seeking to purchase other space for these mill tenants, most likely in a warehouse environment, although he hasn’t identified a site yet. There has been a good deal of work done to rehabilitate the mill over the last 10 years and the prospective tenants looking at space in the mill have shifted to a different type of tenant with fewer manufacturing businesses and more tenants looking for office space, Flannery said. 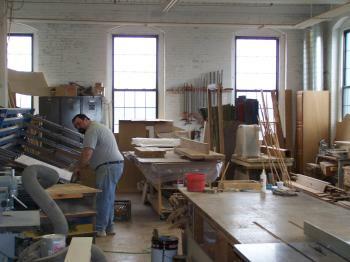 Workshops such as Tim Hill Fine Woodworking and Maine Dovetail, which came to the mill when it was beginning its transition and trying to attract tenants as a business incubator with lower rent, are now on the low end of the financial scale. Some smaller manufacturing businesses said they couldn’t afford to pay much higher rents. Hill said he would need another two years to comfortably make a transition out of the building, given that he put $60,000 into the space when he moved in for renovations and would need to do the same to another space if he moved. Pollak said he initially signed a five-year lease and then a one-year lease, and he said Flannery refused to give him another lease when that one expired in September. Pollak said it will be difficult to find affordable space if Flannery doesn’t find a space for him and the other small manufacturers because businesses like his don’t generate a lot of money. “(Flannery) can get more money out of white-collar businesses. I guess it’s just sort of how it goes,” Pollak said. But he said he’s not bitter about the situation and appreciates Flannery being honest about wanting them to go but not just throwing them out. “I think it was a good move for him to do that,” he said. A worker at Maine Dovetail in Westbrook’s Dana Warp Mill. Mill owner Tim Flannery is looking to move out industrial businesses in favor of office space. 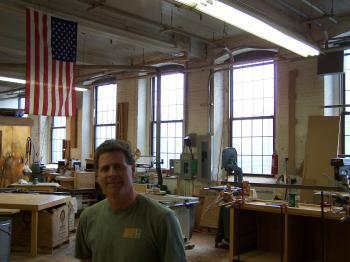 Tim Hill of Tim Hill Fine Woodworking inside his shop at the Dana Warp Mill. Hill is one of several business owners who could be looking for a new home because of mill owner Tim Flannery’s decision to move out industrial businesses in favor of higher-paying office space.